I was automatically drawn into this because of the concept! What a cool idea! Also, one of my favorite actors is a narrator for this (there are 3 people who did this) so of course I had to give it a go. 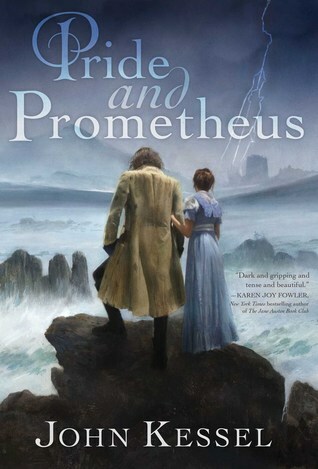 The story follows Mary Bennet from 'Pride and Prejudice', Victor Frankenstein, and Victor's creature from 'Frankenstein'. It has been a few years since P&P ended and Mary is 30 now with no real prospects for marriage. Kitty is also a spinster and is not amused by it. They randomly meet Victor and his cousin who just showed up to town. Victor has promised the Creature that he would make him a bride. This was for sure fun. The author did a wonderful job with the blending. I was unsure how this was going to work. I also adored the little Easter eggs of other books. That was cool. This did move pretty slowly, but the narrators kept me hooked. I am glad I listened to this over reading it, because I can imagine that I would've skimmed a lot. Lots of slow bits and lots of set -up. There was also a LOT of repeating information. We get it. We readers are not dumb. We get it. However, the narrators did wonderful. Once the drama began, I was hooked. I needed to find out what was going to happen next. Oooo that ending. I did not like it. It made me super mad!!!!!!! GRRRR! Cannot say, but I am annoyed. It partially ruined the book for me. I had my hopes and everything was dashed and blown up. Ugh. The story was not bad overall, but the ending really upset me. I'm not happy with it all. The narrators really made this good and kept me going. I do think you should check this out and hopefully you'll appreciate the ending more than me. I'll give this 3 stars. It would be just 2, but the narrators added a star. Sounds nice apart from these repetitions... I hate them! LOL! That ending left me gaping with my mouth open, too. I loved the mashing of the two books and thought it was cleverly done, but yes... the end.